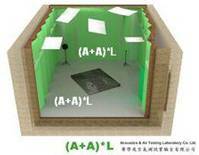 Acoustics and Air Testing Laboratory Company Limited (A+A)*L is a professional and independent testing laboratory incorporated since June 1995 in Hong Kong, equipped with latest technology of instruments in accordance with international testing standards (ASTM, ISO) in providing a full range of Acoustics and Air testing services. (A+A)*L has been accredited as HOKLAS Laboratory by the HKAS Executive and has been assigned registration number . Building elements and partitions, wall, floor-ceiling assemblies, façade elements and façades, doors, window, roofs, panels, and other space-dividing elements. Sound absorptive materials, such as acoustical materials with air cavity backing, ceiling tiles, wall panels, baffles, office screens, theater chairs, and space absorbers.